A yummy, savory breakfast that hits all of the right notes–crunchy, salty, gooey and just plain yummy! Do you want to impress your Thanksgiving house guests or a special someone on New Year’s morning or Valentine’s Day with a new dish? What about on Easter morning when you have neighbors and friends over for brunch? Try our loaded potato-Parmesan Waffles with Eggs and you will be the star of the gathering. Peel and grate potatoes; squeeze dry in a clean dish towel. In a bowl, mix potatoes with cheese, butter and shallot; season with salt and pepper. Coat waffle iron with non-stick cooking spray. Using a quarter of the potato mixture for each waffle, cook over high until golden and crispy, about 6-8 minutes. Top with an egg, bacon and parsley. Season to taste. I used a large box grater for grating the potatoes, but you could use frozen hash brown potatoes. The shallot was grated using a fine microplane. We always cook our bacon in the oven using a wire rack placed over a cookie sheet. This allows it to cook through, stay flat and the fat drips onto the pan. Spray the wire rack with Pam or a similar product. We put a paper towel in the bottom of the cookie sheet to absorb most of the bacon fat. We placed the egg into a cookie cutter to make a fried egg shaped like a star for a fun presentation. Crisp is well known for its salads and smoothies. Crisp, originally started as a food truck in downtown Lynchburg, VA. Then it morphed into a small brick-and-mortar shop on Church Street. And now they have expanded once again into a great spot at the corner of 12th and Church Streets. The new space, at 1124 Church Street, allows plenty of seating for dine-in guests, large windows on all sides and plenty of space to expand the menu offerings. In addition to their delectable and varied salads, juices and smoothies they are now offering locally roasted coffee, gourmet soups and house baked breads. Soon they will be opening a catering division of Crisp. They would love to add a beer garden in the garage space that is attached to their building. As before, the restaurant is an assembly line style service featuring customizable salads, wraps, juices, smoothies and smoothie bowls. When possible the ingredients are locally sourced and are sustainable ingredients. The next time you are staying with us at The Carriage House Inn Bed and Breakfast, and wander to downtown Lynchburg to explore all that it has to offer, you now have a great spot for a snack or late lunch. We are excited to see this company grow and offer something that Lynchburgers are asking for. Breakfast Bake-one pan cooking and easy cleanup. The breakfast bake is an easy recipe that involves only one pan (baking sheet) for a complete breakfast. This makes clean up real easy. Follow the directions below. Everything is cooked in the oven, including the egg! It makes the ideal breakfast when you have a bunch of people over for breakfast. The egg holds everything together. Enjoy the breakfast bake. Above we used diced potatoes. You could use hashbrown potatoes instead. Fill the other side of the same baking sheet with bacon. Bake in oven 10-12 minutes until bacon is fully cooked. Place bacon and potatoes onto a paper towel to absorb excess grease. Discard grease from baking sheet, but do not wipe clean. There should be a thin layer of grease remaining. Line the same baking sheet with the asparagus and tomatoes. Top gently with eggs and bake for 6-7 minutes or just until the whites are set. Spread the potatoes and bacon back onto the baking sheet. Bake for an additional 2 minutes. Once out of the oven sprinkle with parsley, salt and pepper. Serve and enjoy. Serves 6. A smoothie is a great way to get some needed nutrients at breakfast, lunch or as a snack during the day. At The Carriage House Inn Bed and Breakfast we oftentimes serve a “smoothie shot” as our first course when serving a sweet breakfast entreé. Guests love them and it’s a nice way to begin your breakfast. Place the strawberries, watermelon, peach, sorbet and orange juice in a blender. Puree until smooth and creamy. Add more orange juice if you like it a little less thick. Serve immediately in tall glasses with straws. **we serve our smoothies in shot glasses, so we dilute the mixture a bit to make it easier to get out of a small glass. Mexican, egg and tortilla chip scramble served with a soft taco on the side. We’re celebrating Cinco De Mayo this month at The Carriage House Inn Bed & Breakfast, in Lynchburg, Virginia. As most of you know by now, we alternate a savory and a sweet entrée each morning for our guests. This month we will be serving this egg scramble as our savory entrée. Come stay with us and experience a slightly different take on scrambled eggs. Melt butter in a 10-inch cast-iron skillet over medium-high heat. Add the poblano, scallions and jalepeño; cook, stirring occasionally, until lightly softened, 1-2 minutes. Add the corn and ¾ teaspoon salt; cook, stirring occasionally, until the vegetables are soft, about 2 more minutes. Whisk the eggs with ¼ cup water and ½ teaspoon salt in a large bowl. Add the eggs to the skillet and cook, stirring constantly with a rubber spatula to form large curds, until the eggs are softly scrambled, about 2 minutes. Add the tortilla chips, ¾ cup cheese and the cilantro to the skillet; cook, stirring, until well combined, 1-2 more minutes. Sprinkle the scramble with the remaining ¼ cup cheese and top with avocado, sour cream, pico de gallo and more cilantro. It is suggested you have all of your ingredients prepped, measured and ready to go before you start the actual cooking process. This recipe moves rather quickly once you start cooking. All peppers “heat” are found in their ribs and seeds. You can adjust the spiciness of the peppers in this recipe if it sounds too spicy. We used 1 fresh ear of corn to produce ½ cup corn kernels. We added a bit more than the suggested measurement. We added about 1/2 cup of browned mild Italian sausage. It adds a bit more flavor plus a meat protein to the dish. You can use Spicy Italian sausage if you’d like. We serve this savory breakfast entrée with warm corn tortillas, fresh from the garden sliced tomatoes and a combination of warm black beans and corn. Go crazy and serve a Margarita! Those of you who follow our blog know we post a recipe each month. The recipe usually pertains to the month, a holiday during the month or foods that are seasonal to the month. Along those lines we were going to post this recipe during the summer months. 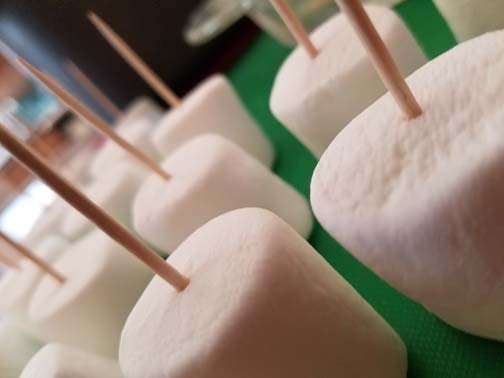 But since it seems as though summer is here now the S’mores On a Stick recipe is available for your cookouts, campouts, hikes or bike trips, or just to eat in your own backyard around your fire pit. 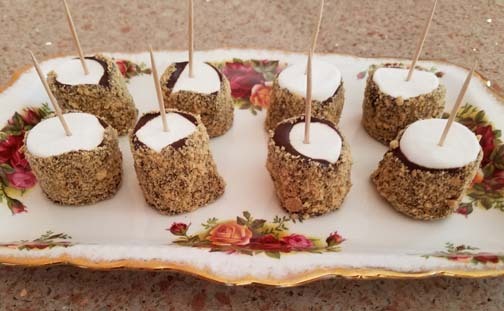 They are delicious, easy and fun…..even if you don’t need an actual fire to make them. Line a baking sheet with parchment paper. Place the graham cracker crumbs into a shallow dish and set aside. Spear the marshmallows with a toothpick. Melt the chocolate chips in a double boiler, over medium heat, stirring occasionally. 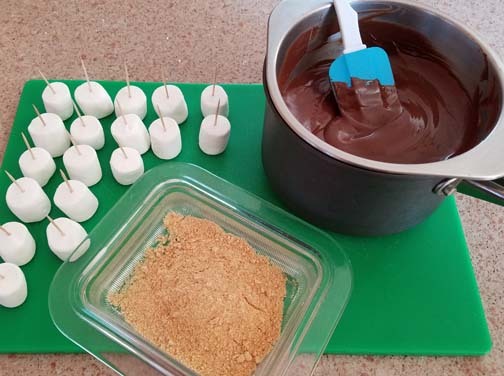 Dip the marshmallow sticks into the chocolate, one at a time, letting any excess drip off. Roll in the graham cracker crumbs and place on the prepared baking sheet. When finished preparing the s’mores place the baking sheet into the refrigerator for about an hour to allow the chocolate to set. Gently peel off the parchment paper to serve. Enjoy in your backyard or in the wilds, or for a summer treat anytime during the year.